A birthday balloons clipart is ideal for making invitations for a birthday party decorated with balloons, or to simply create a colorful greeting card. Make sure to check out these 9 best resources for free balloon clipart and then come back to learn more about making your own stylish cards. Ever since scrapbooking has become a popular past time of people of all ages, folks have been handmaking cards. Making cards is similar to scrapbooking, and a lot of the same materials and skills are used. The only difference is that the embellishments, photos, and messages are put on a smaller page. You can usually purchase blank cards in craft stores and add whatever items you think are appropriate for the holiday or occasion. Best of all, you can carry the balloon related theme throughout the entire party. Not only can you decorate the setting with actual balloons, you can include the theme in all components of the event. Birthday celebrations typically have a birthday cake and balloons. For a balloon themed party, you can even decorate the cake itself with balloons. Ask the baker to choose colours for the frosting-balloons that match the other items at the party. You can match the cake to the cups, plates, and napkins, or you can match everything to the bunches of balloons you are supplying. This way, your theme will not only be consistent, your colour palette will be complementary as well. If you know the birthday celebrant's favourite colour, choose items in that colour family. A stylish, elegant idea is to make all of the items monochromatic. Choose one colour and supply balloons, cups, napkins, plates, and balloons in varying shades of that colour. If the party is wilder, choose a mix of exciting colours in metallic or sparkle shades. Birthday balloon clipart is a great way to make the invites match the rest of the theme, and let the guests know ahead of time what the theme will be. You can make the invitations yourself inexpensively by using free balloon clipart. 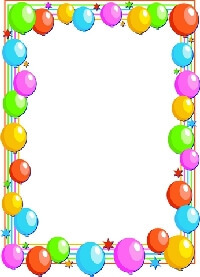 Balloon borders clipart, like the example shown here, is especially suitable for making invitations. Or how about hot air balloon clip art? Depending on the colours and style of the invite, your guests will understand how formal the party is going to be. This helps them decide what to wear, what to choose as a gift, and what to expect as far as fun and entertainment are concerned. Chances are, a balloon theme is going to be fairly casual, but you can dress is up by choosing a basic colour scheme like black and white, or by using metallic colours and balloons. For an extra touch on the invitations, consider writing the party details with a metallic pen. If you have ever wanted to create elegant cards, invitations, and other party items, now may be the time. The range of birthday balloons clipart available online is nearly limitless and you are sure to find what you are searching for. If you are thinking you are not up for a full-blown handmade party, try your hand at the occasional card featuring birthday balloons clipart. Once you have the hang of creating handmade paper art, you will be ready to take on all sorts of projects!